This gift is Gluten Free. A gift from The Fruit Tree™ is a gift from the lush, fertile orchards of California and Oregon. 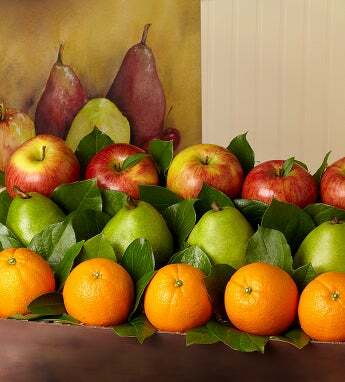 Our fresh fruit assortment includes 5 crunchy Braeburn apples, 4 juicy Comice pears and 5 ripe-from-the-tree navel oranges. A gift from The Fruit Tree™ is a gift from the lush, fertile orchards of California and Oregon. Our fresh fruit gift box assortment includes 5 crunchy Braeburn apples, 4 juicy Comice pears and 5 ripe-from-the-tree navel oranges.